This Sea Buckthorn oil is extracted via steam distillation of the fruit or seed part of the plant. This oil is contains omega 3, 6, 7 and 9 and is richly composed of both macro nutrients and micro nutrients. It contains vitamins B1, B2, folic acid, C, E, beta-carotene (pro-vitamin A), and K. The berries of the plant have rich composition of antioxidants such as polyphenols, carotenoids, flavonoids, phytosterols and tocopherols. Offered Sea Buckthorn Oil is rich in terms of nutrients, proteins and essential fatty acids and all these constituent elements are necessary to make skin healthy and strong. This Sea Buckthorn Oil is completely natural and is perfectly safe for use. It provides a multitude of additional health benefits to users. It has oily feel and should have approximate dilution of 1%. The colour of its seed oil is pale to medium yellow and that of its fruit pulp oil is deep orange. Sea Buckthorn Oil is used extensively in the manufacturing of beauty products and medical industry for treatment of various skin related problems, gouts, gastrointestinal ulcers and arthritis. It helps in the revitalization of the skin and healing of wounds. It quickly repair wounds and helps in the healing of all kinds of skin damage, cuts, burns, radiation burns more quickly when treated with the oil. It is reliable and safe for use for which it is widely demanded and used by most clinics. Its concentrated vitamins enhance and promote skin growth and provide suitable environment for scars and burns to get back to normal state. This oil possesses lots of therapeutic properties such as antioxidant, anti-inflammatory, demulcent, anti-ageing, circulation booster, skin cell regeneration, sunscreen, anti cognitive decline, anti-cholesterol, anti-radiation, anti-fungal, anti-bacterial, anti-cancer, anti-asthmatic, emollient, stomachic, vulnerary, rubefacient and expectorant. Blends Well With : The Sea Buckthorn Oil blends well with Omega-7 soas to prepare a soft gel. The Sea Buckthorn Oil is generally prepared from the fruits and seeds of the berries of the plant. It has been known for its medicinal attributes for several of years. It has dark amber and reddish colour sue the presence of deeply pigmented carotenoids in the berry of the plant from which the oil is extracted. It has a very unique smell like moist wood. When this oil is used in vaporizer or oil burner, it its aroma slowly dissipates. 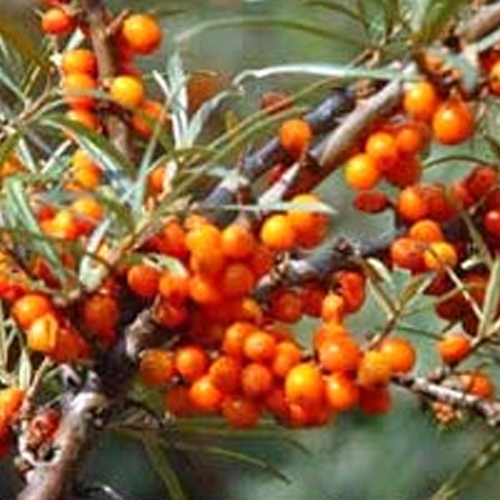 It is strictly recommended for a pregnant or breast-feeding patient to not to use sea buckthorn oil. It is advised to consult to doctor before taking sea buckthorn oil in such case and should be taken in small doses. We have relations with leading shipping partners like DHL, Fedex, UPS, TNT and EMS which ensure timely transit at customers’ destination. Moreover, we also ship our quality goods by means of air as well as sea.